Iran has increased its efforts to finance and carry out terrorist activities across the world and remains a top nuclear proliferation threat, according to a new State Department assessment. Iran is funding and arming leading terrorist groups in the Middle East and elsewhere, according to the State Department’s 2014 Country Reports on Terrorism, which thoroughly documents how Tehran continues to act as a leading sponsor terror groups that pose a direct threat to the United States. 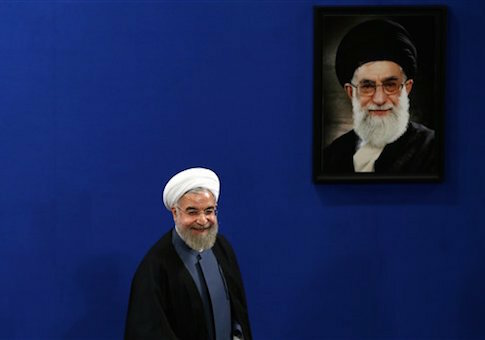 The report comes as Western powers work to finalize a nuclear deal with Iran ahead of a self-imposed June 30 deadline, though it is unclear whether the new findings will come up in negotiations. "In 2014, Iran’s state sponsorship of terrorism worldwide remained undiminished through the Islamic Revolutionary Guard Corps-Qods Force (IRGC-QF), its Ministry of Intelligence and Security, and Tehran’s ally Hizballah, which remained a significant threat to the stability of Lebanon and the broader region," the report states. In addition to al Qaeda and the Islamic State (IS, also known as ISIS or ISIL), Iran leads the list of dangerous state actors. "ISIL and AQ were far from the only serious threat that confronted the United States and its allies," according to the report. "Iran continued to sponsor terrorist groups around the world, principally through its Islamic Revolutionary Guard Corps-Qods Force (IRGC-QF)." Iran also is failing to comply with international restrictions on its contested nuclear program and has not lived up to obligations to come clean about past military work on nuclear weapons, according to the report. "Iran remains a state of proliferation concern," it states. "Despite multiple [United Nations Security Council resolutions] requiring Iran to suspend its sensitive nuclear proliferation activities, Iran continued to be in noncompliance with its international obligations regarding its nuclear program." The Islamic Republic’s support for terrorism spans across the Middle East and even into the Western hemisphere, which remains a particular concern to U.S. officials. Iran’s terror affiliations include "Lebanese Hizballah, several Iraqi Shia militant groups, Hamas, and Palestine Islamic Jihad," the report states. "Iran, Hizballah, and other Shia militia continued to provide support to the Assad regime [in Syria], dramatically bolstering its capabilities, prolonging the civil war in Syria, and worsening the human rights and refugee crisis there." Iran’s support for the embattled Syrian president includes sending arms shipments through Iraqi airspace, which violates U.N. Security Council resolutions barring such action. This support is meant "to belittle coalition airstrikes and U.S. contributions to the Government of Iraq’s ongoing fight against ISIL," according to the report. However, the report also notes that Iran’s interference in Iraq has been positive in the fight against IS. "Iraqi security forces, including the Kurdish Peshmerga, in conjunction with Iranian-backed Shia militias, demonstrated some ability to confront this challenge," it states. Iranian support for the terror group Hamas, which controls the Gaza Strip, also increased in 2014. In March, for instance, the Israeli government intercepted "a weapons shipment containing 40 M-302 rockets, 181 mortars, and hundreds of thousands of rounds of ammunition from Iran believed to be destined for militants in Gaza," according to the report. On Israel’s northern border, Iran continues to arm Hezbollah with sophisticated weapons meant to be used in attacks on the Jewish state. "Iran, primarily through the efforts of the Islamic Revolutionary Guard Corps-Qods Force (IRGC-QF), continued to transfer arms to Hizballah," the State Department found. "Israeli experts believe that Iran is trying to arm Hizballah with advanced weapons systems such as anti-air and anti-ship cruise missile systems, as well as continuing to transfer long-range rockets into Lebanon," it states. Additionally, "Iran has admitted publicly that it armed Hizballah (in violation of UN Security Council Resolutions (UNSCRs) 1701 and 1747) with advanced long-range Iranian manufactured ‘Fateh’ missiles." Outside of the Middle East, Iran continues to expand its influence in a bid to establish itself as a world power. "Iran and its proxies also continued subtle efforts at growing influence elsewhere including in Africa, Asia, and, to a lesser extent, Latin America," according to the report. "Iran used the Islamic Revolutionary Guard Corps-Qods Force (IRGC-QF) to implement foreign policy goals, provide cover for intelligence operations, and create instability in the Middle East. " The United States has "remained vigilant in its efforts to monitor Iran’s influence in the Western Hemisphere," the report claims. This entry was posted in National Security and tagged Iran, Nuclear Iran, State Department. Bookmark the permalink.